Every artist, craftsman, maker likes being part of a dream, the best part of it usually is to team up with the dreamer to discuss, elaborate, plan and realise the dream ! But in the case of The House for an Art Lover the dreamer long passed away the challenge was to be so interesting that I had to take part. 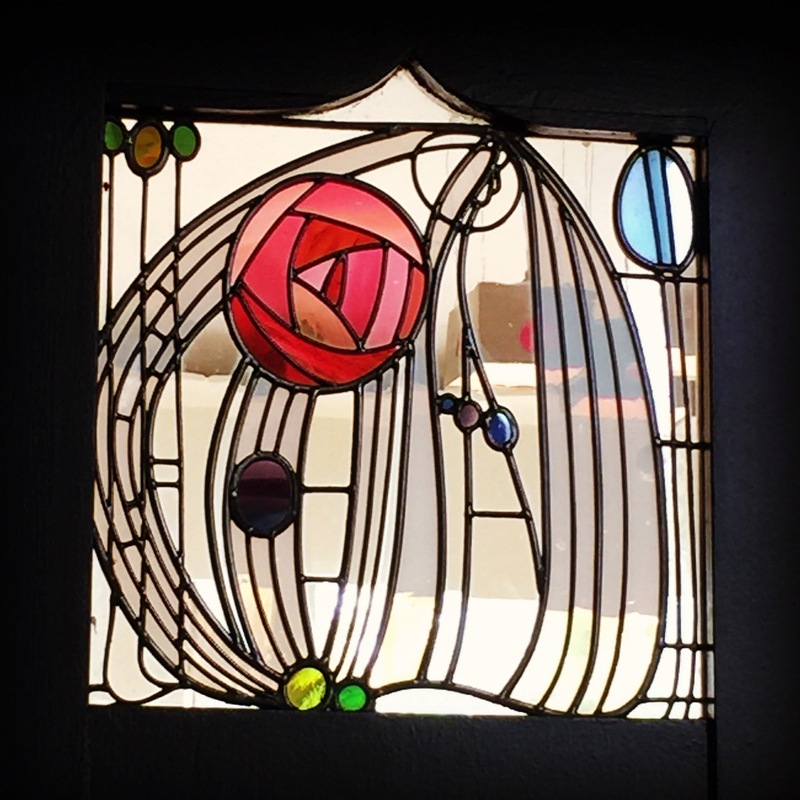 How wonderful to interpret the original dream of an artist such as Charles Rennie Mackintosh and … with a team of makers and planners make it alive for all to discover, admire, dream about too. 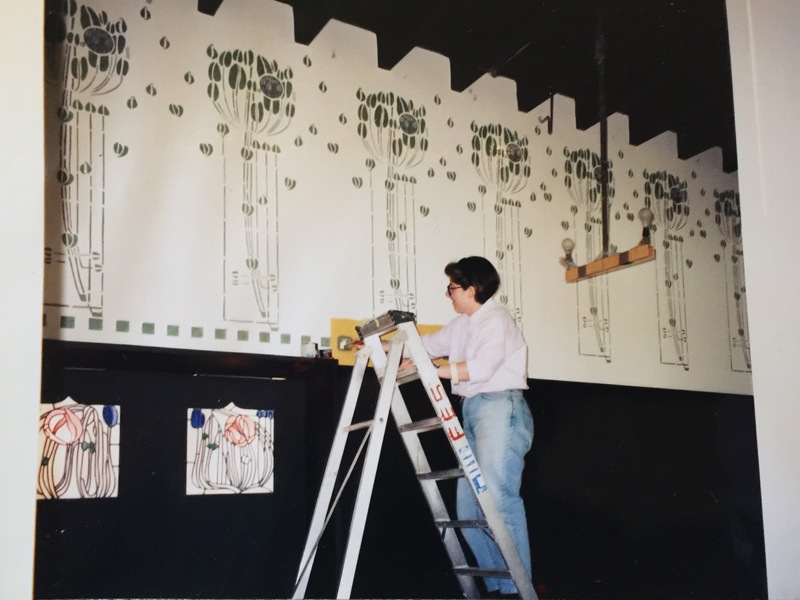 That was the challenge of The House for an Art Lover in the 1990’s ! You need a magical vision to take on such a dream and Graham Roxburgh a local consulting engineer had just that when running one morning in Bellahouston park and the rest is history. He raised awareness and the funds to start the work, could not complete and the City of Glasgow and the Glasgow School of Arts took over. The whole point is that almost 100 years after being designed by a genius, a great team of people from Glasgow and further afield joined forces to built a stunning building in the middle of a park for all to admire and care for. The best part of this adventure is that I was commissioned to team up with a group of makers to realise the interior. My task was to come up with the stencilled schemes for the music room, the dining room, the large panelled hall and the gallery upstairs. With very basic sketches that was a very good challenge. Part of this challenge was to decide on the designs used. 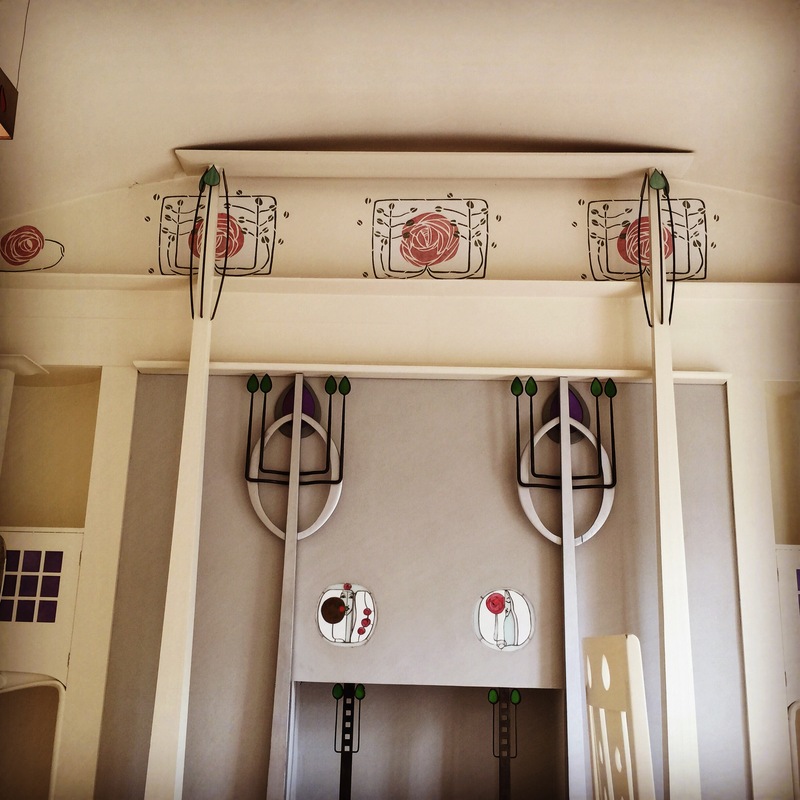 So many possibilities, do you use existing Mackintosh designs and adapt them? to come up with some original designs in the ‘Mackintosh style’ ? 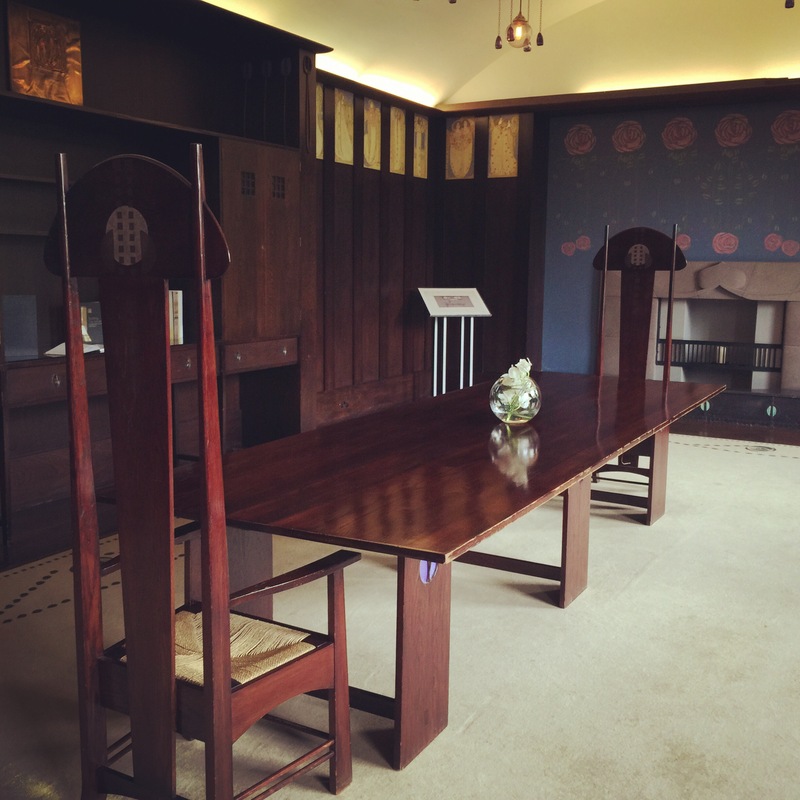 Mackintosh and Margaret were always so unified in their interior schemes. 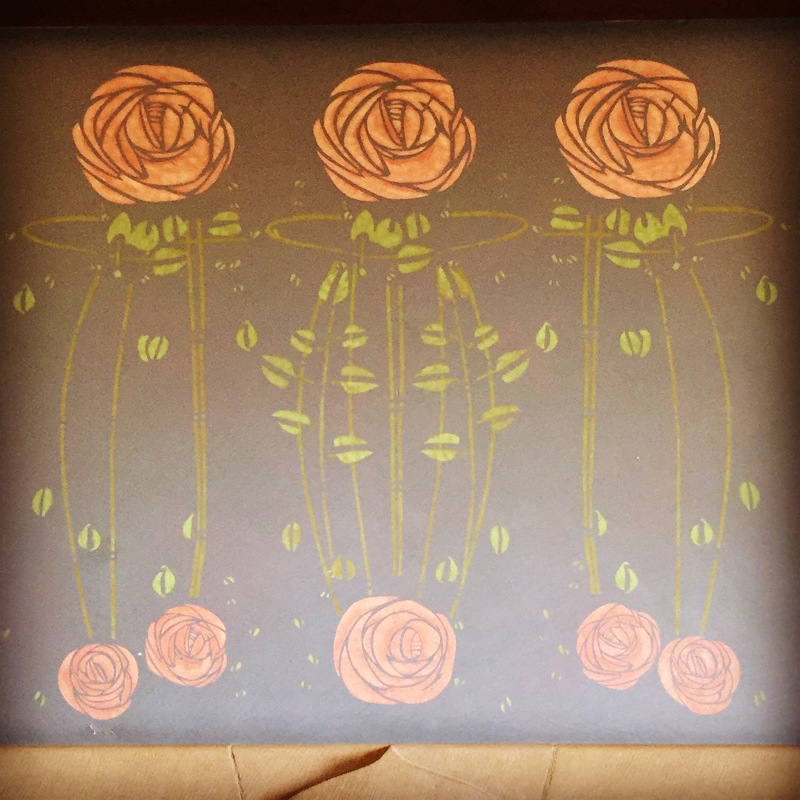 It was very important to liaise very closely with the other makers to insure the colour schemes were perfectly coordinated, as if they had been chosen by the original designer and his wife. 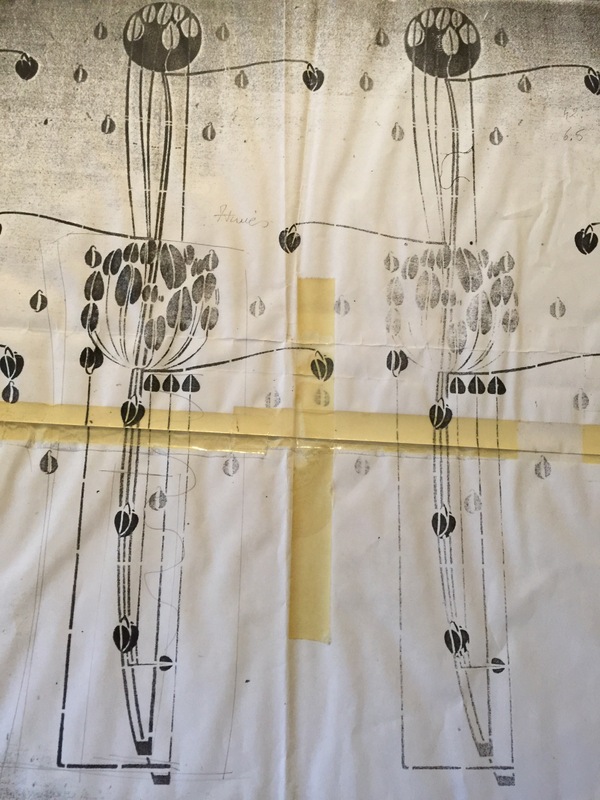 For the dining room, Dai and Jenny Vaugh were to work on the gesso panels above the picture rail. 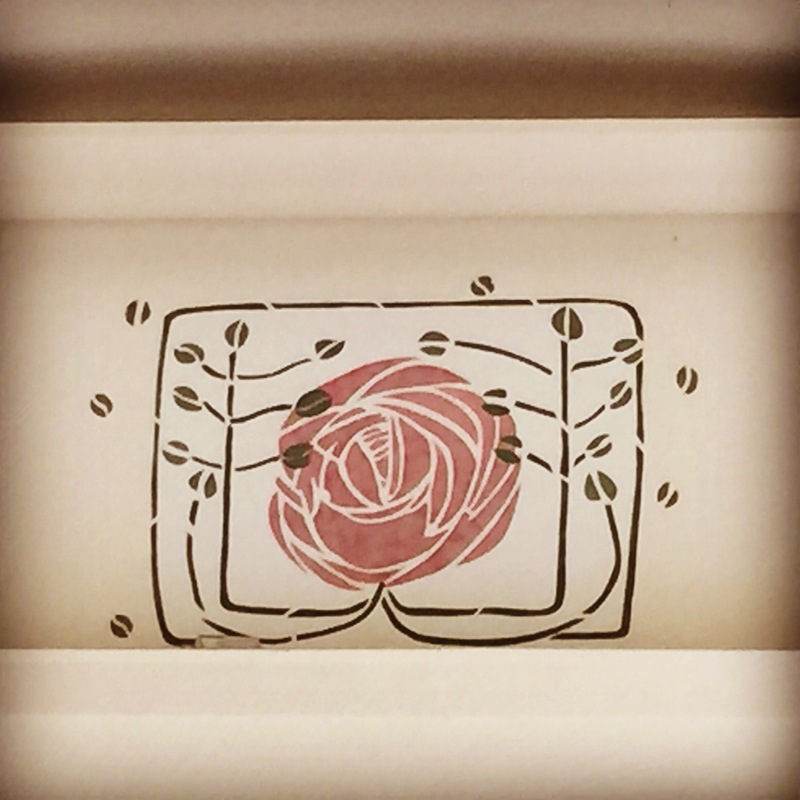 A beautiful story of ‘The Rose’ in a delightful blue background which was going to become the background for the fire place stencilling of the rose motif. Together we teamed up to come up with the most beautiful purple/blue shade. The result was stunning and is still today enjoyed by many as this is the room most couples getting married in the House chose for their ceremony. 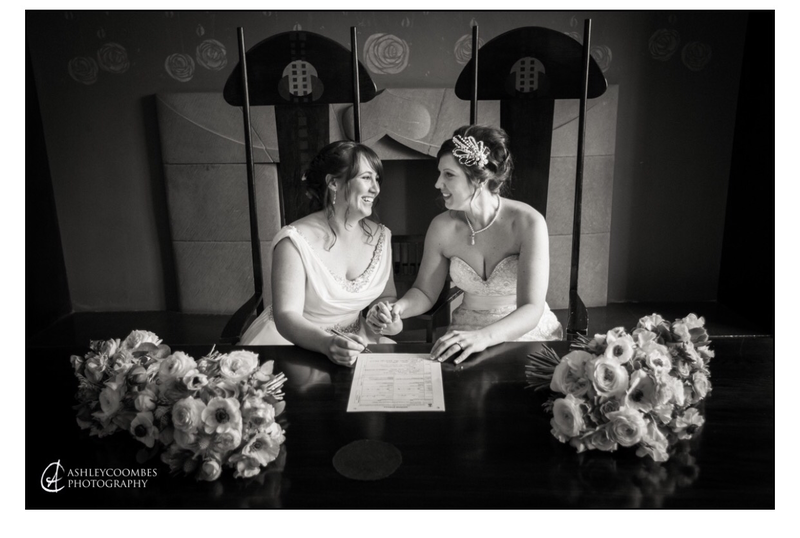 I have seen to my great pleasure many bride and groom photographs in front of my stencilled fire place. What a great reward for me to see my work being admired again and again ! 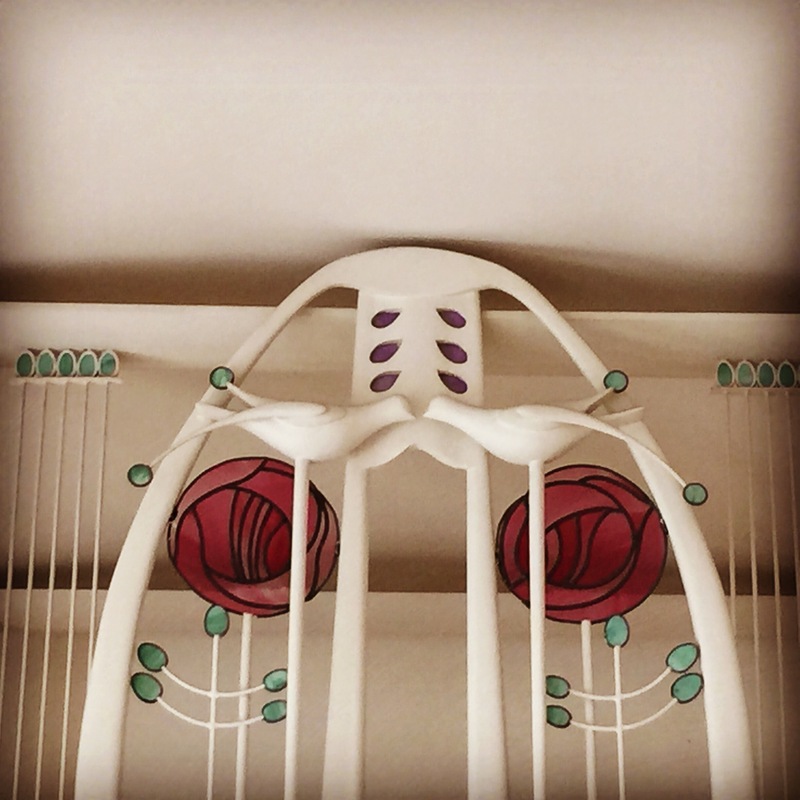 (Even if my work was only to illustrate Mackintosh’s dream…). For the design of this fire place frieze, much research took place and I looked at many rose friezes, but one caught my eye and it was that of The Hill House master bedroom. 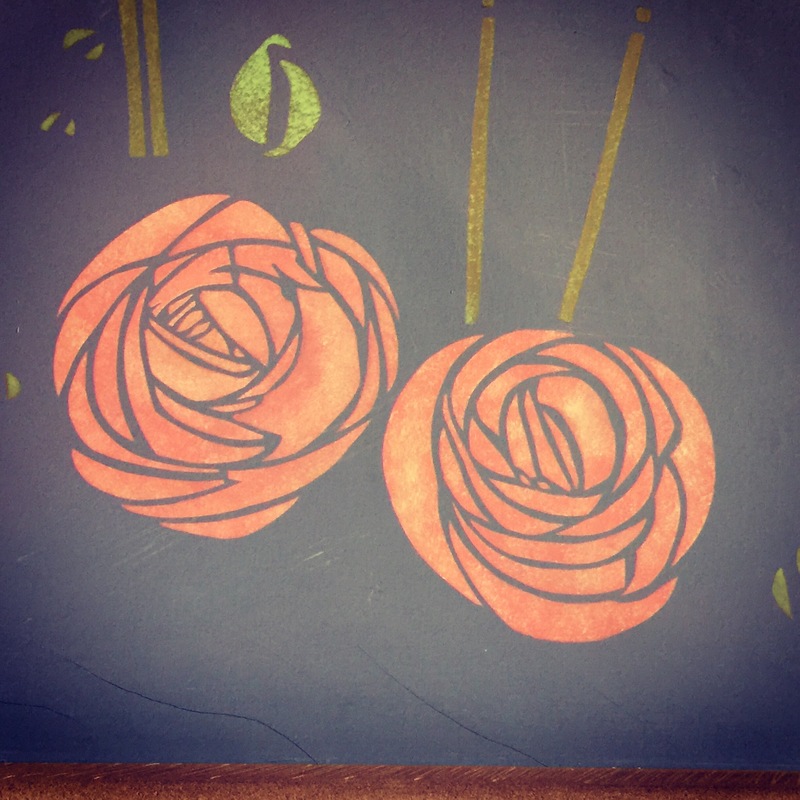 Very similar in shape to that of Mackintosh’s drawing for The House for an Art Lover. It was decided the dining room would be very much inspired by the former. The final plan was approved by The School of Arts and up it went. I can not tell you how scary it was to allow anyone to look at it at first. 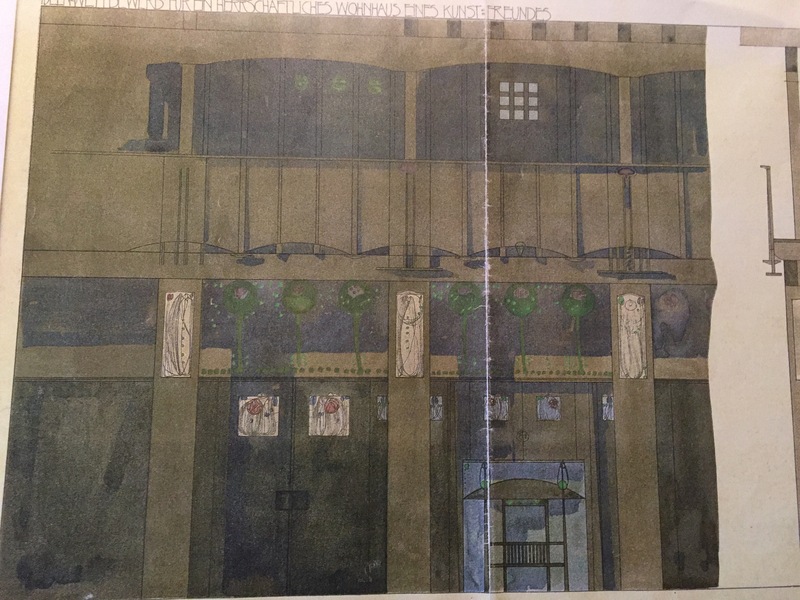 Would anyone approve of this work or would they not think it was up to Mackintosh’s dream? One of the best part of the project is the makers I met while working on this commission with whom I still work today. 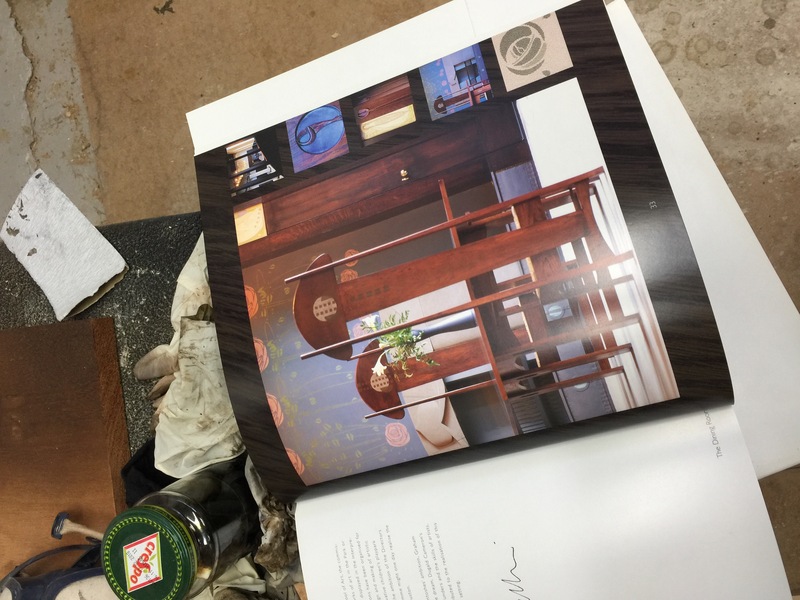 Like Bruce Hamilton the furniture maker. Together we made the chairs for this dining room. 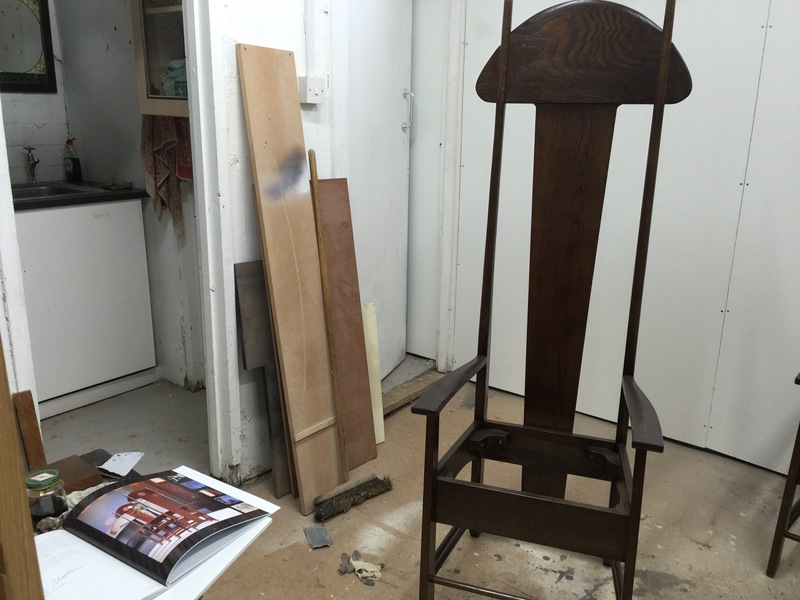 Bruce was commissioned to make the dining room furniture. 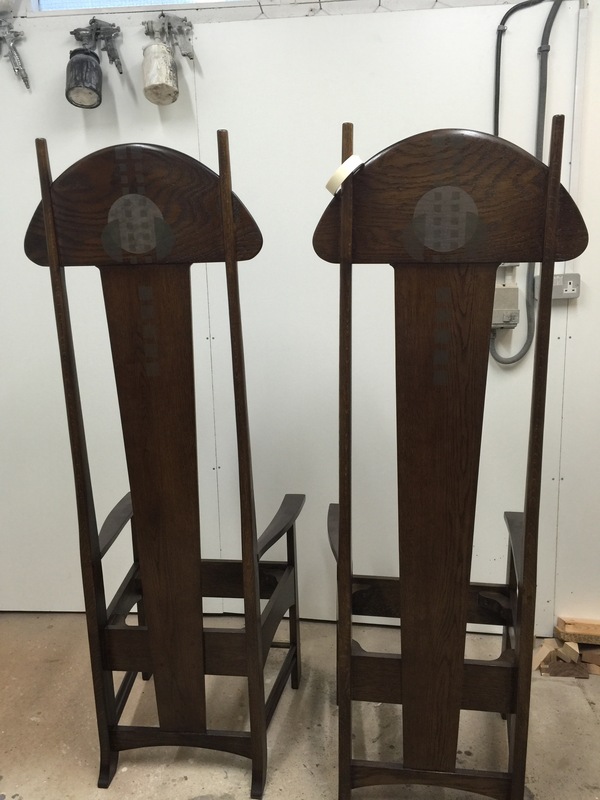 He is a genuine furniture maker with a true understanding of wood and joints, his workshop is full of magic and he has been working on Mackintosh chairs for many years. A great deal of expertise. 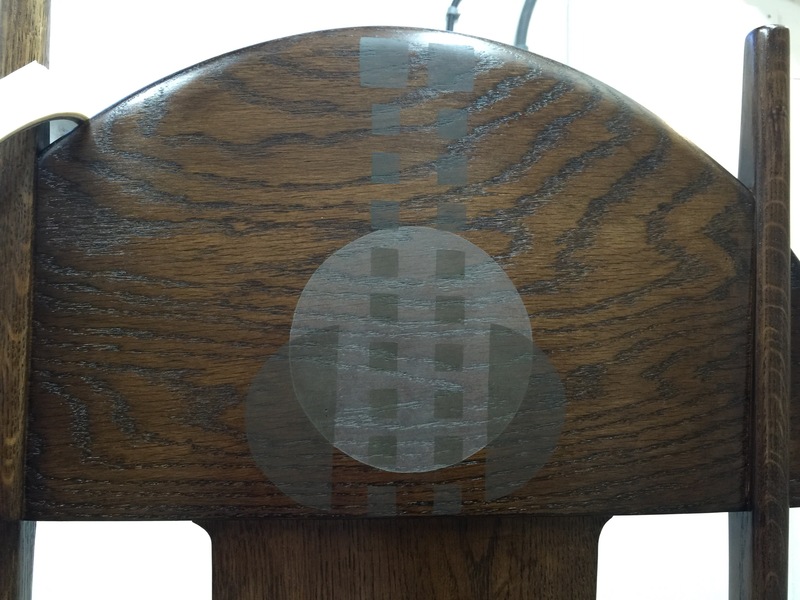 He made the chairs… I stencilled them… great team work ! and we still work together today. We have this understated connexion which comes out of sharing a very special task. 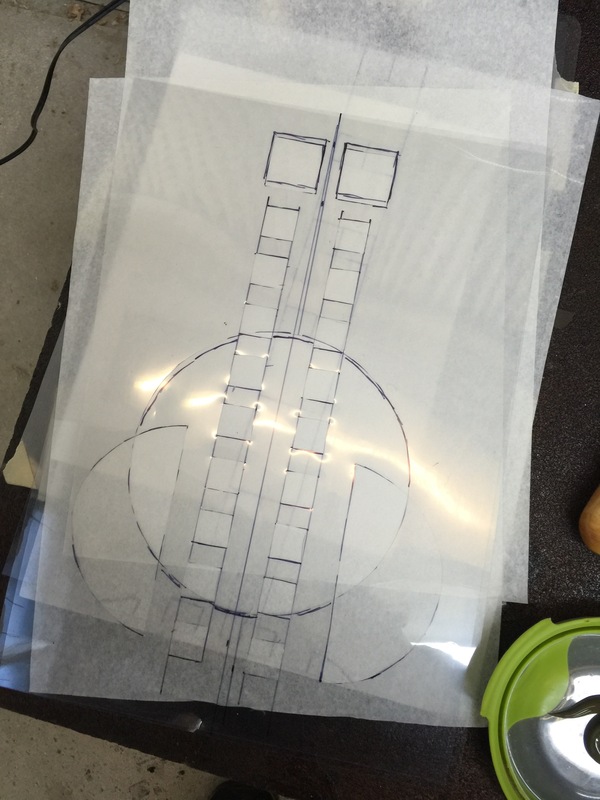 Today he makes clocks and I stencil them ! But this is still the Mackintosh connexion. I have though one regret about this commission and I might one of those days raise the issue again and it is about the painted over frieze which probably no one remembers apart from a handful of people !!! The large panelled hall had a very clearly stencilled frieze in the shape of a geometrical tree in some drab green and pink. 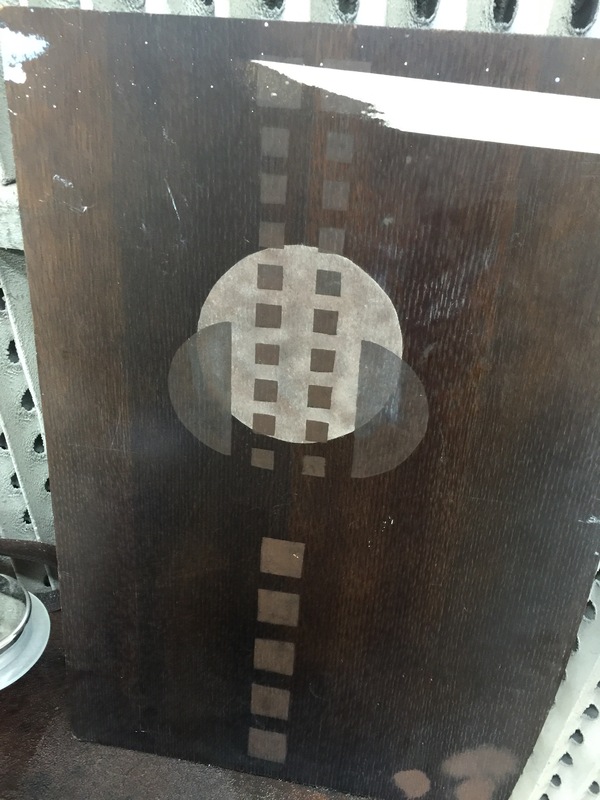 I came up with a design, it was approved and I spent 2 months up a scaffolding stencilling it. As tall as me a very impressive motif. It was truly stunning but… a couple of weeks before the opening… The Glasgow School of Arts on the basis that none of the other built Mackintosh properties had stencils in their halls decided to paint over. 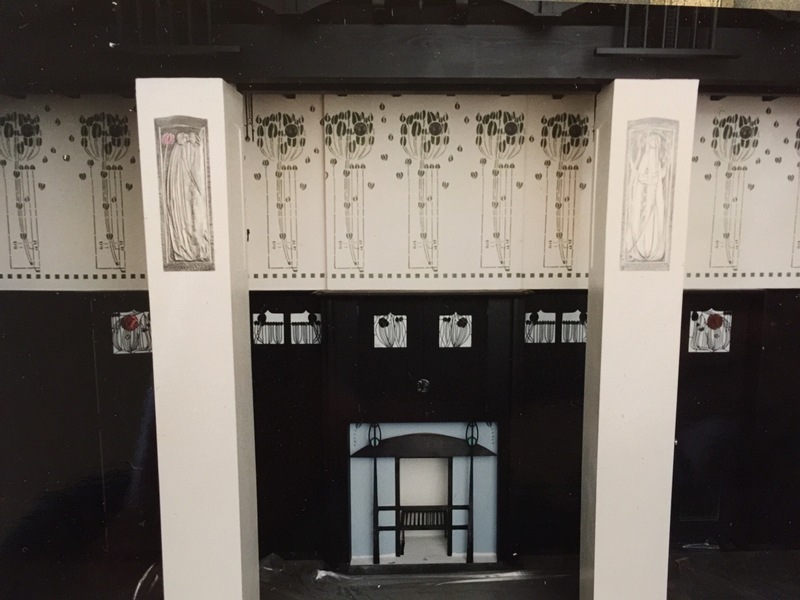 The rational was that Mackintosh would have probably changed his mind and not gone ahead with the design. I am not so sure about this. I think the great man had the right to have a variation on his usual theme. 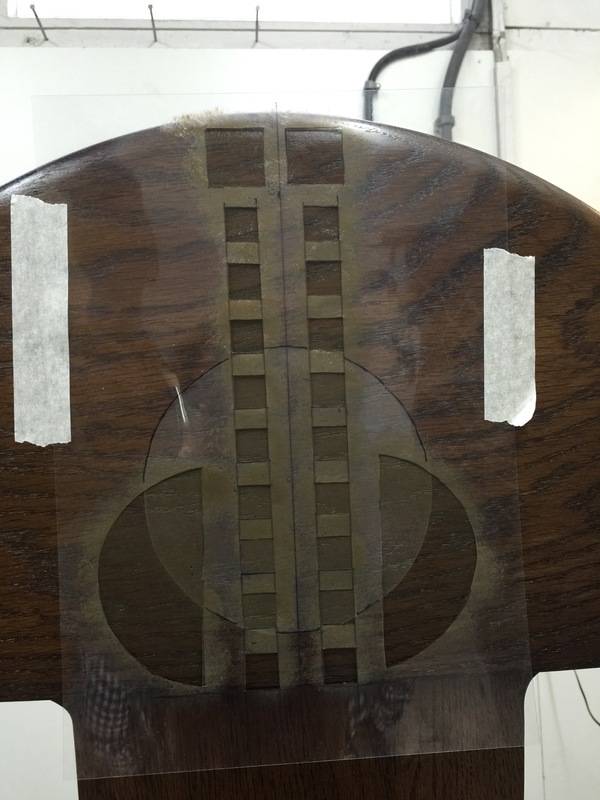 Below is the photo of the stencilled scheme taken before it vanished. I have the hope one day it will be reinstated. I visit the house regularly, I even run classes there every season. It is terrific to see this work marvelling the visitors. It is great to have your own dreams but its even better to work with others to make a Genius’s dream come through for many to admire.